As Cinnabar has shown, Marks & Spencer are the kings of odd Chrismas Crisps, but it seems that the Euro supermarkets are keen to catch up. Today we look at the offerings that Lidl have brought to the table. The vegetarian friendly Goats Cheese & Apple Chutney, and the carnivore friendly Gin & Juniper Roast Pork. Disclaimer time - I'm not going to eat the goats cheese crisps. Originally I was tempted to try one for the review purposes but the smell of the goats cheese was just overpowering. 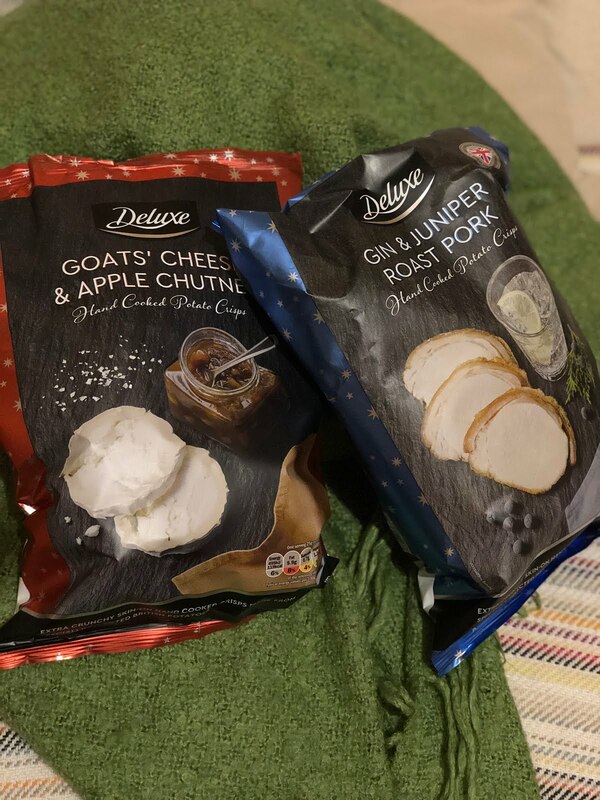 That said the two people who have tried them that love goats cheese were fairly protective of them anyway and happy to eat a bag per sitting if allowed. They were not particularly christmassy (they have stars on the bag?) but I don't think anyone would care - and I don't think non cheese fans would accidentally pick some of these up of the buffet table - they have an aura! The Gin & Juniper Roast Pork were far more my style, but the gin really wasn't a prominent flavour and these are essentially a large bag of roast pork crisps. That said they are of a good quality (a notch below Kettle maybe) and the flavour is an interesting one that keeps you dipping into the bag. Most people's 'ooh gin' response resulted in a slight air of disappointment around them though and the bag didn't get demolished in the break room in a single lunch time as I'd anticipated. This was good for me as I'm happy to finish the bag. Maybe not as big a hit as the goat & apple, but if you left the bag next to them you can guarantee every one who liked meat & gin at your party would try them. And question where the gin was. There are a few more flavours in the range too, and as they are all quite reasonably priced we may try more (that said I already have instructions to pick up more of the goats...).